I find that boredom is the #1 reason why people stop working out. No two classes are alike. Each class is always fun, exciting, challenging, and engaging.Expect a Sweat Dropping, adrenaline-rush workout that ANYONE can do - no matter your age or fitness level. You jump in a class with a can do attitude and follow moves that make you feel like a Kickboxing Boss - get lean, fit,and toned! Kanika is all about training your mind, your body the key combination to win. She will coach you get to a better version of your current self. It's not just about losing weight or getting a better body, it's about confidence, accomplishment and falling in love with yourself through working out. Kanika will push your boundaries and limits of your workouts to help you become physically tones, fit and strong and mentally tough! 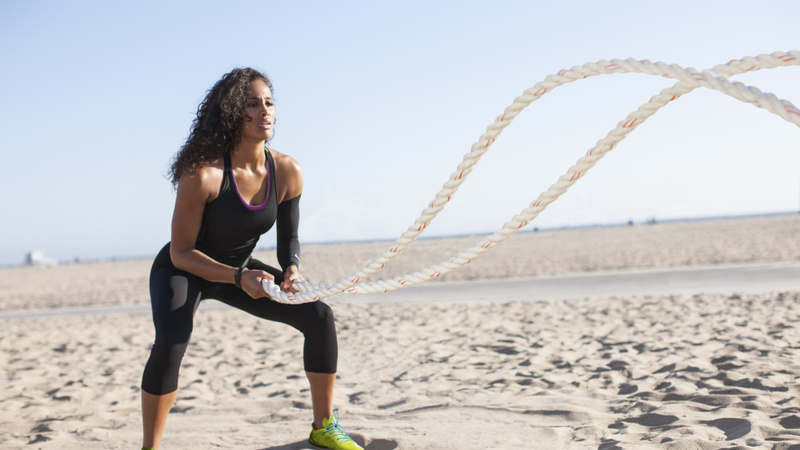 ​​Kanika is a dynamic gym Owner, Coach, Instructor and Personal Trainer who based in Tarzana, Ca. She has been featured on Mlb Network, Espn, and also as a guest speaker on the Dodger Radio Show. She has been in Fitness for over 25 years. She's a Graduate from The University of Southern California in Exercise Phyisiology, All American Track and Field competitor and Ranked sprinter, whose clients include celebrities, professional athletes, and daily health enthusiast. Kanika works with each person on an individual basis, focusing on achieving long-term results through challenging and daily varied workouts. She is widely recognized for her expertise in creative functional training and developing and implementing innovative fitness techniques. As well as her ability to produce top sprinters and Major League Ball Players. Kanika's high energy and humor only add to the effectiveness of the experience her clients enjoy. With a client list as diverse as her training methods, Kanika specializes in sprint and conditioning training for sprinters and Major League Baseball players being the first female trainer in MLB. She has also expanded her hand into working with NFL, MMA, professional boxing and various NCAA sports. Many film and television celebrities have also sought Kanika's guidance in preparing for roles and have stayed on to become devoted clients. She is the developer of a Savage Workout, a project that features a 40min full-body and body-part specific workouts focused on strengthening the body and achieving the fitness of a Professional athlete. Kanika is an amazing instructor who has taken love for martial arts, Her achievement in Track and field, her education(Masters in Exercise Physiology) and experience that delivers the final knockout to the missing link of weightloss and fitness. kanika is married to Dodger Coach Tarrik Brock. She has 2 sons, Tj Brock, highly noted and Junior World Champoin sprinter, and Chris Brock, honor student in High school and baseball standout. In order to bring out the best in you , we strive to recuit the best of the best trainers who custom design the best workouts to acheive maximum results. No matter your fitness level we have the right class and instructor for you. We strive to create a safe place, a sense of family and a place where you can grow. Welcome Home! I always start workouts and get bored and move on to another gym. With Kanika, I am never bored and always seeing results. You walk into Cardio Grind and you are in a safe place, it is family and it is home. You walk out and you can tackle your day with confidence. I love the Cardio Grind. Kanika and her surprise workouts are amazing. Cardio Grind Instructors are awesome! They push you to be your best and are always so encouraging. I love the music and the intensity! The class seems to go by fast and I am drenched at the end! I love the enthusiastic instructors, the music, and the difficult workouts. I love the Cardio Grind it is always a fun class great music hard workout.